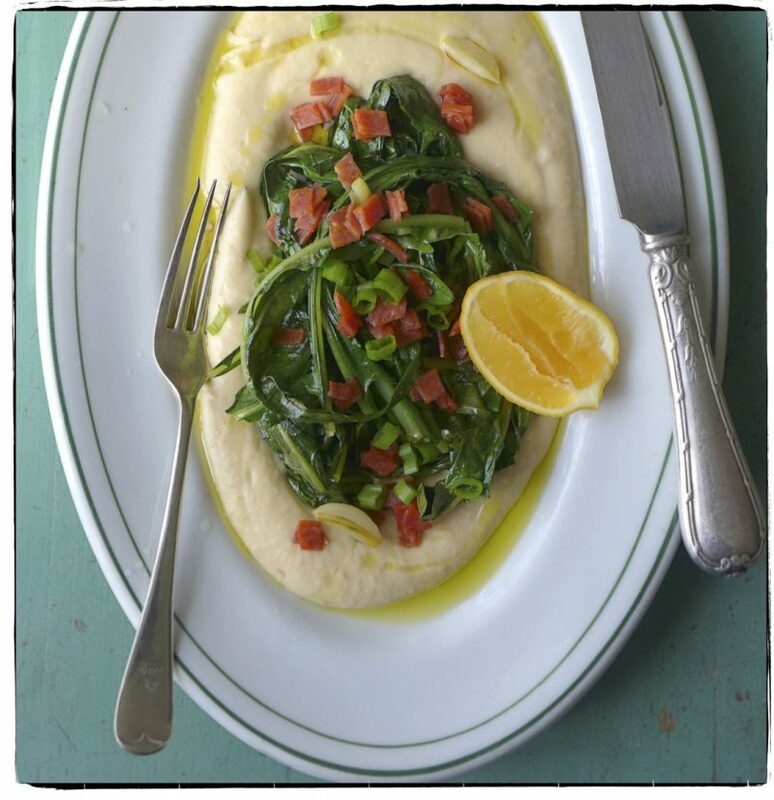 We boiled spears of trimmed and peeled asparagus in a pot of salted water; then scrambled some eggs in a bowl and set it on the pot, over the water—a makeshift double-boiler. 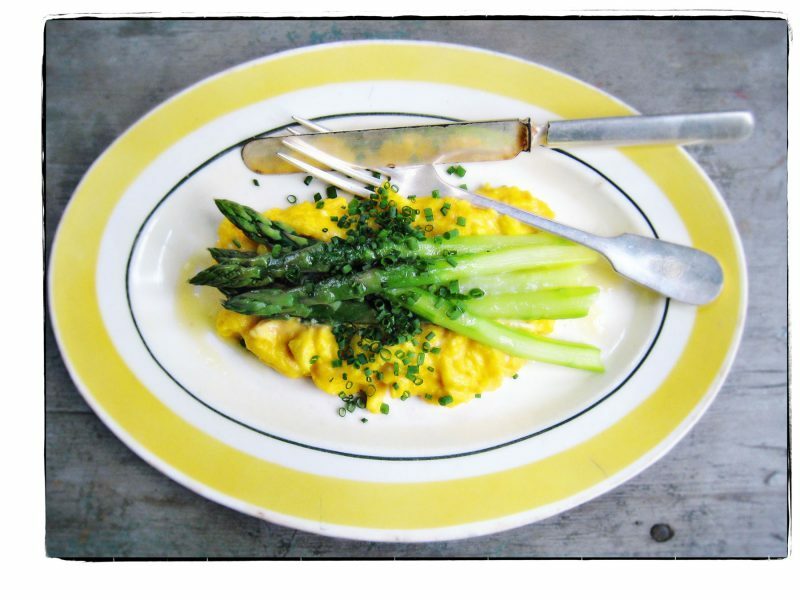 The eggs cooked into soft, creamy curds and were ready just when the asparagus were. So it’s scrambled eggs and asparagus with a little melted butter, lots of chopped fresh chives, and a good pinch of salt for lunch today. Yesterday our friend and neighbor, Tama Matsuoko, went foraging in the backyard. She wrote Foraged Flavor (Clarkson Potter, 2012) so she is our guru on the subject. Inspired—and lured by the warm sun and the greens that grow more lush by the day—we headed out ourselves. We found: par-cel (a hybrid of parsley and celery), wild garlic mustard greens, mint, oregano, baby beet greens, chives, and just beyond the garden fence, violets. 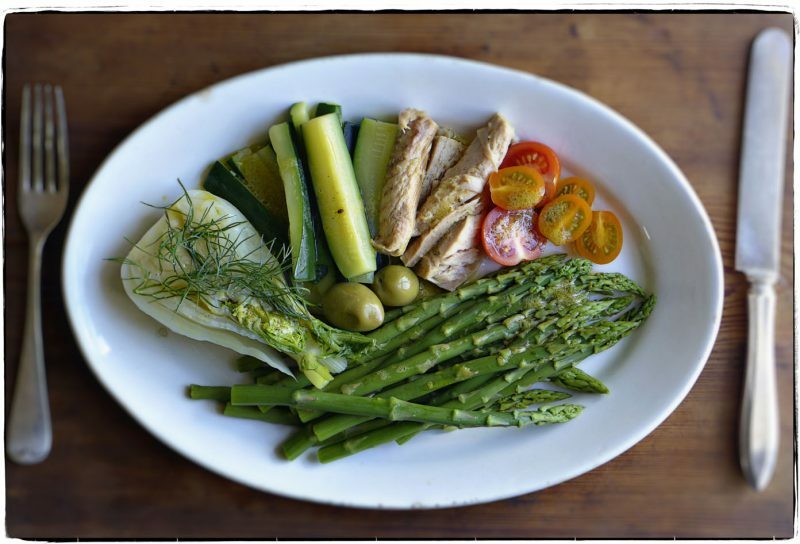 It was enough for a salad for two with a simple olive oil and lemon juice dressing. But still, not quite enough to hold us until dinner. 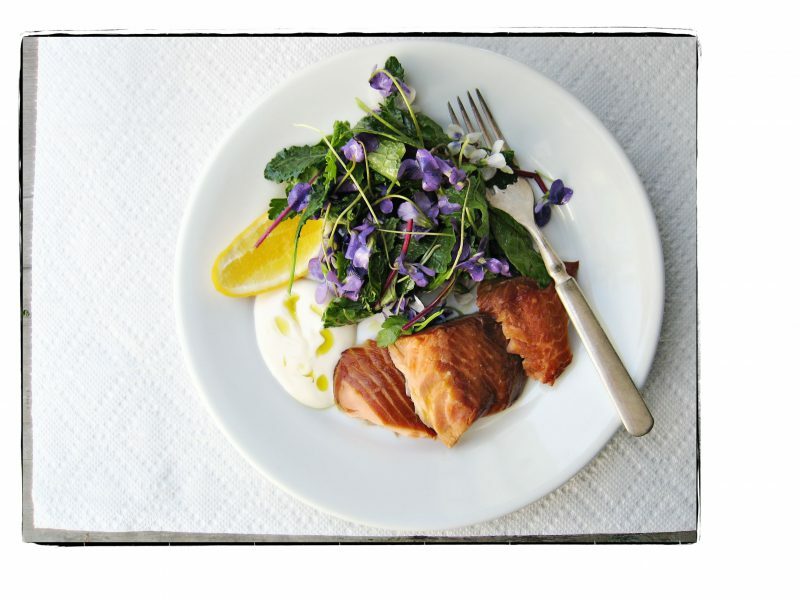 So we added hot smoked salmon with dollops of doctored mayonnaise. We looked for the wild arugula that comes back every year—no sign of it yet, maybe tomorrow. 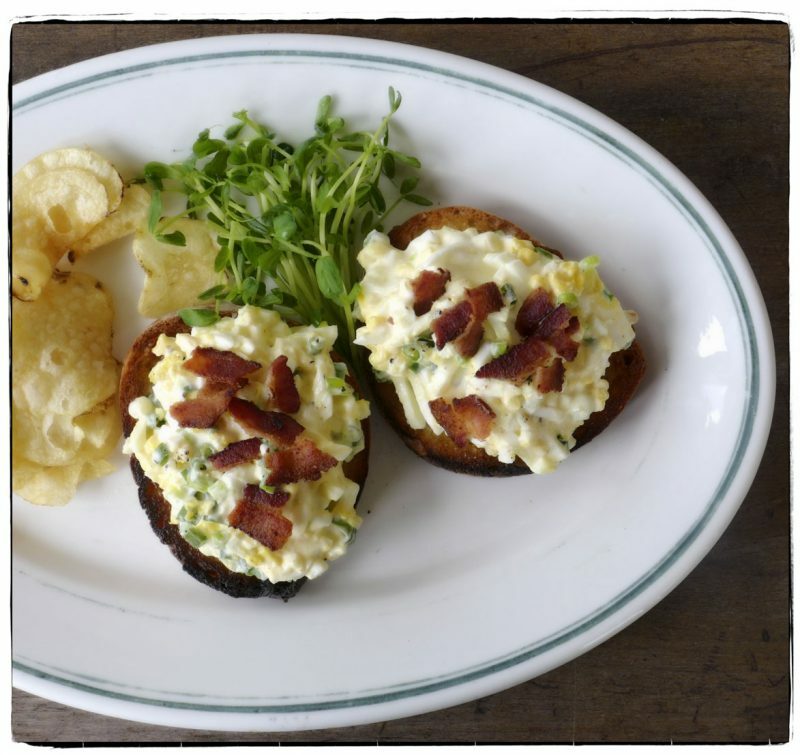 This pretty day deserves a pretty lunch of open-faced egg salad and bacon sandwiches with a few potato chips to add a bit of crunch. 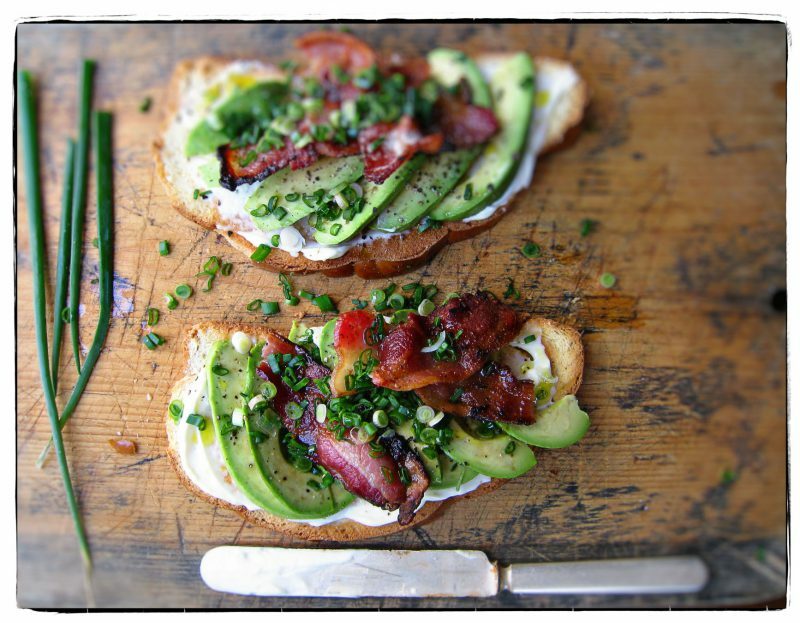 We keep it simple—mayo, a smidgeon of sour cream, scallions, salt and pepper, and of course, bacon. A lovely ladies’ lunch for two earthy dames. Happy Monday, dear friends! We faced an empty cupboard this morning—what ever would we have for lunch? Then we dove deep in the the fridge and came up with: frozen ground turkey, chives, scallions, cilantro, and a container of Maya Kaimal’s Coconut Curry. 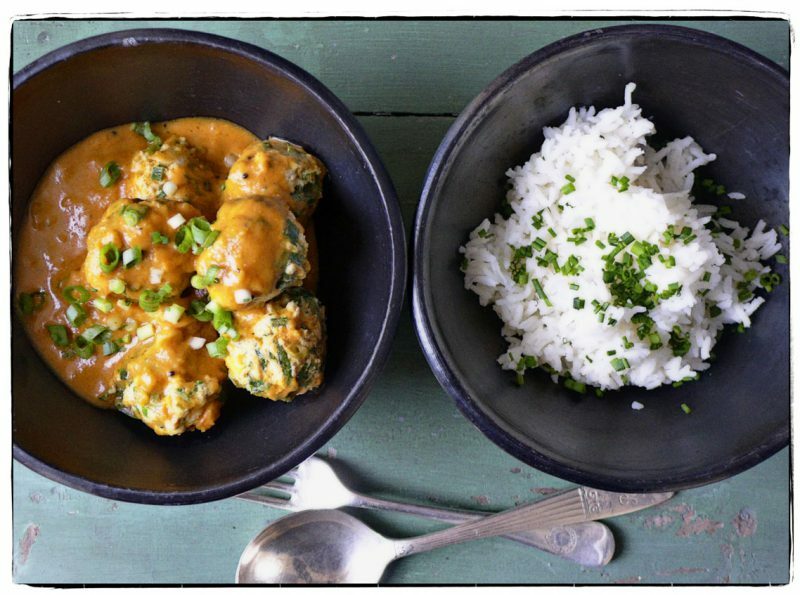 We defrosted the ground turkey; cooked a pot of fragrant basmati rice; mixed and rolled up some little meatballs with lots and lots of chopped cilantro, scallions, and chives, then simmered them in the curry sauce. Note to selves: Buy more of Maya’s curry sauce. 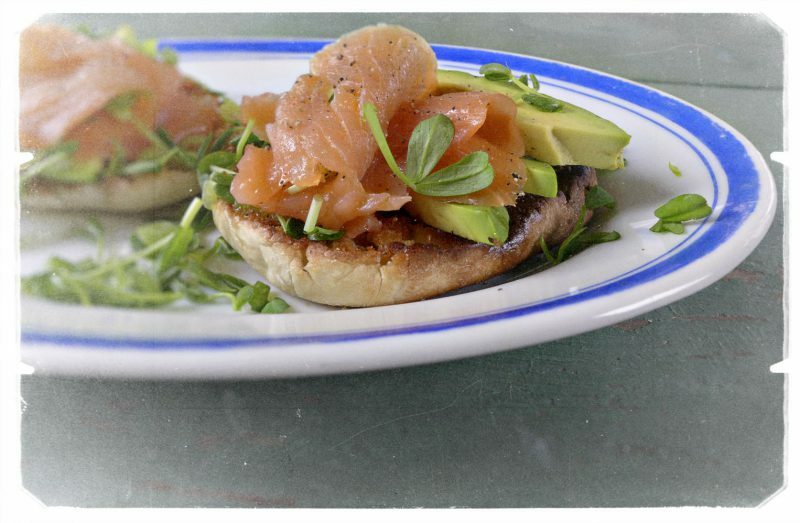 It was a late lunch today—buttered toasted english muffins piled with smoked salmon, avocado, chopped scallion, and sweet pea sprouts. We washed it all down with glasses of Sohm & Kracher Gruner Vetliner, not bad for an ordinary, old Thursday. A spring lunch of sautéed dandelion greens and chorizo on puréed white beans with a squeeze of Meyer lemon to tame the bitterness. Before you mow the grass, pick some dandelion greens—they are the perfect spring tonic. It’s a very sunny breezy 75° day. In the garden, the star magnolia is flowering, the mighty rhubarb is pushing through the earth, and the onions, that wintered over, are ready to pull. At this early stage we used them like scallions for today’s lunch: toasted brioche slathered with mayonnaise, sliced avocado, crisp bacon, salt and pepper, olive oil, and lots of those chopped spring onions. We’re going outside to have a picnic on this glorious day! Our doors are thrown wide open on this first gorgeous day. From the canal down below, voices of men fishing for trout float up into the studio. Inside and outside are coming together. 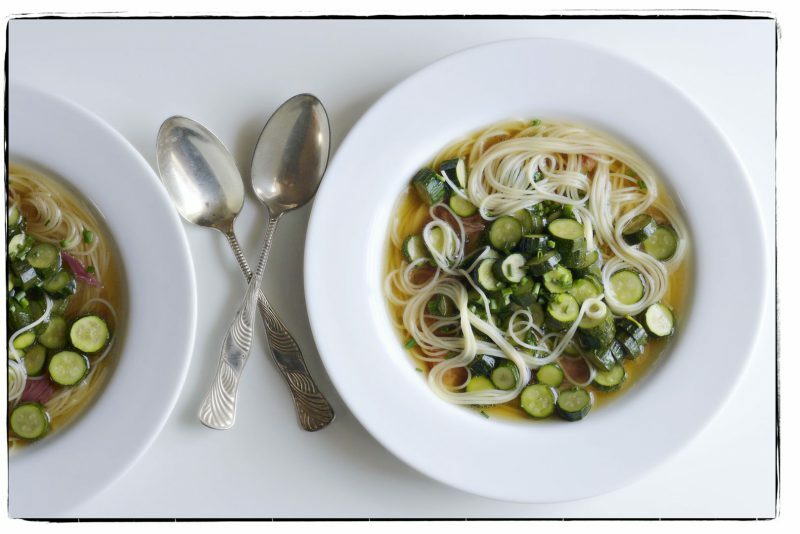 Our version of a primavera is this spring soup of little zucchini and ham poached in a rich brodo. We snipped the very first chives from the boxes on our balcony to add the finishing touch. We “Frenched” two racks of Jamison lamb just before Easter, then hand chopped (we couldn’t find the meat grinder) the leftover meaty scraps. We stashed the chopped meat in the freezer until today. 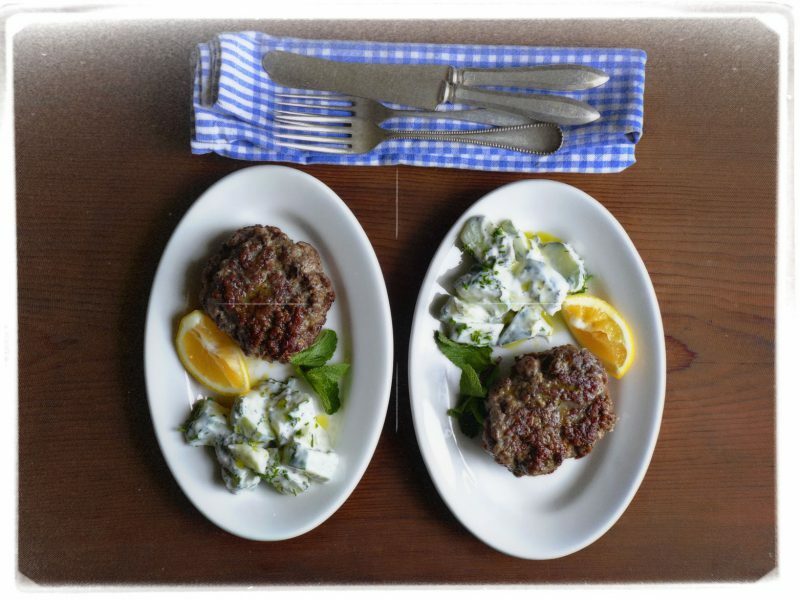 So it’s lamb burgers for lunch with a crunchy cucumber salad dressed with yogurt, mint, olive oil, and chives. Our friend Julia Lee, from the balmy west coast, sent us a box of Meyer lemons from her very own tree. They arrived just as we were about to sit down to eat, so we sliced one open and brightened our burgers with its sweet juiciness. Thank you JL. We hit the freezer of our local Italian market and bought a box of handmade cheese tortellini and a package of frozen fava beans— so eager for spring, we can’t wait for the fresh favas to arrive. We blanched the favas, slipped off their tough skins, and dressed the bright green beans in a vinaigrette loaded with chopped parsley. 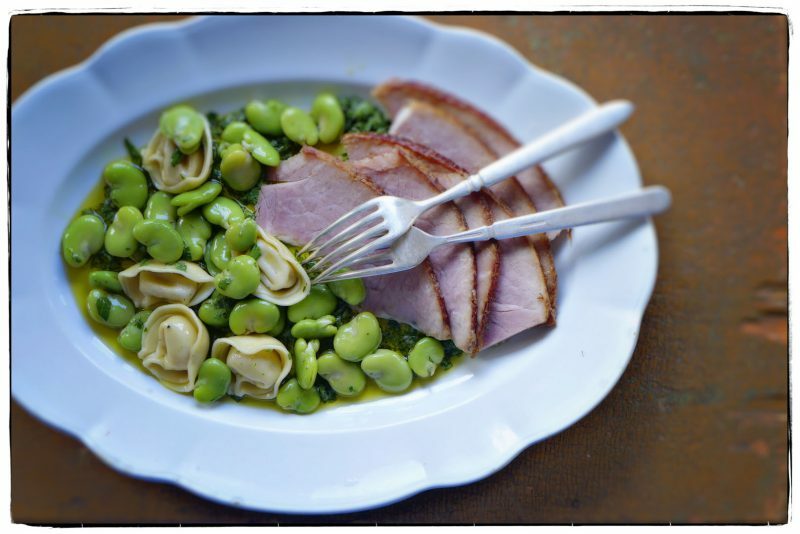 We slipped a few cooked tortellini in with the favas and piled them on a platter with a few slices of leftover Easter ham for lunch today. The daffys are all in bloom, but they need their sweaters today. 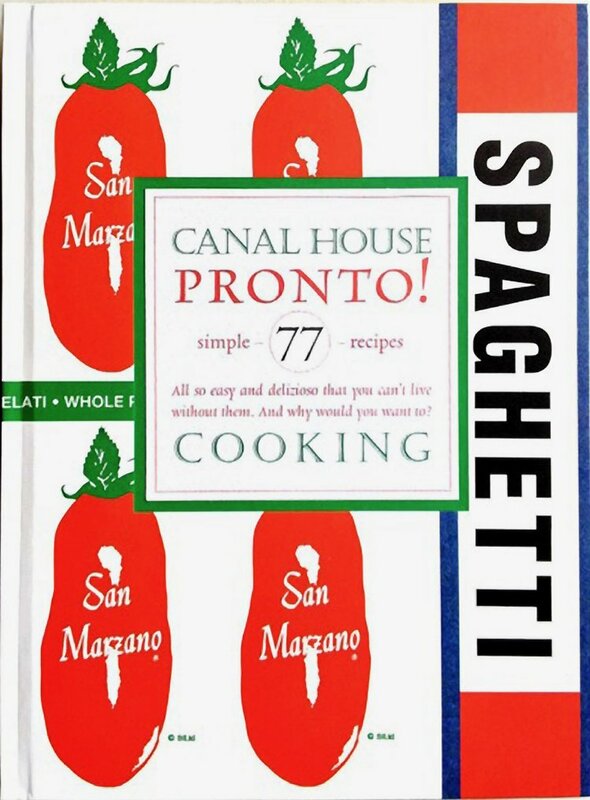 Our inspiration was a beautiful jar of Italian tuna packed in olive oil hiding behind cans of whole plum tomatoes in the pantry. We had a little of this and a little of that veg-wise in the fridge, so we made good use of it for today’s lunch. A good old-fashioned mustardy vinaigrette lubricated everything. We boiled two very fresh eggs for the salad but ate them while we were making it. We were starving. Imagine an egg in the picture. 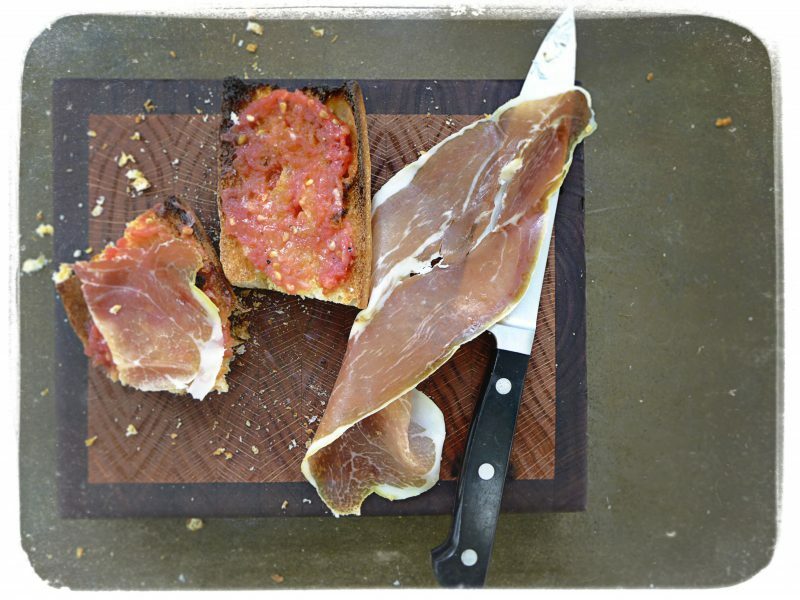 A Monday lunch of the simplest tomato bread from Cataluña—pan con tomate—with thin slices of jamón Serrano. We toasted slices of crusty baguette, rubbed the toast first with a clove of peeled garlic, then with the cut side of a halved ripe plum tomato, smearing the flesh and juices on the bread. We anointed the toasts with a drizzle of really good extra-virgin olive oil and a sprinkle of salt. Sometimes we add a slice of Serrano ham, as we did today—downright addictive. Happy April Fool’s Day. Get up to some shenanigans!